Kehinde Kolawole Eleja, SAN | K. K. Eleja & Co.
Mr. Eleja, SAN was admitted to the Nigerian Bar as a Solicitor and Advocate of the Supreme Court of Nigeria in 1993 having satisfied the requirements to be so admitted. Mr. Eleja was a pupil state counsel at the Benue State Ministry of Justice, Otukpo from 1993-1994 during his National Youth Service Scheme. He was exposed to acts of criminal prosecution rendering legal advice on behalf of the Director of Public Prosecutions of the State and generally representing the State Government and its agencies in litigation in courts. 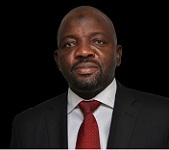 He joined the law firm of Yusuf Ali & Co. in October, 1994 as a junior counsel and rose to become a Partner and the Head of Chambers, the position he maintained until his disengagement from the law firm of Yusuf Ali & Co., on the 31st July, 2011. Mr. Eleja has in the course of his career represented corporate and individual clients in all the courts of records in Nigeria, Commissions of Inquiry, Arbitration Panels, Election Petition Tribunals, among others. Though he is tested in all aspects of legal practice, he has bias for Administrative Law, Election Petitions, Electoral Law, Corporate and Commercial Practice, Taxation, Telecommunication, Criminal Prosecution and Defence, Arbitration, Chieftaincy Matters, Labour and Industrial Relations and Real Property Law. He was appointed Senior Advocate of Nigeria on 10th July,2015 and formally sworn in on the 21st day of September, 2015 after having been found worthy of the prestigious rank by the Legal Practitioners’ Privileges Committee. Mr. Eleja is a co-author of the book “Eminent strides of A Judicial Titan: Tribute to Honourable Justice MMA Akanbi”. He has also contributed published articles and papers in reputable journals, including the book “Anatomy of Corruption in Nigeria: Issues, Challenges & Solutions- edited by Yusuf Ali, SAN. Mr. Eleja was the chairman of the Nigerian Bar Association, Ilorin Branch from November 2005 to October, 2007. He was also a member of the Kwara State Criminal Justice Committee during the same period. He was a member of the National Executive Committee of the Nigerian Bar Association from 2005-2009. He was the Editor-in-chief of the Kwara Bar Journal, a publication of the Nigerian Bar Association, Ilorin Branch from 2004-2007. He has received various awards from Law students of Tertiary institutions and other organizations across Nigeria in recognition of his contributions to law as an advocate and a legal practitioner. including a meritorious service Award from the Nigerian Bar Association Ilorin Branch, among other awards. And had attended conferences within and outside of Nigeria. Election Petition and Electoral matters.